You can do it yourself, or hire somebody else, in which case, check our growing list of poison ivy control companies by state. If you would rather do it yourself, my advice is below, but there is no easy or totally safe way to deal with these plants. There is no easy and totally safe way to deal with poison ivy, poison oak, or poison sumac. You can poison them, which can kill your healthy plants, and many consider the herbicides to be unsafe for people, pets, and wildlife. You can tear them out by hand, which puts you in danger of a hospital-grade rash. While I tend to favor the non-poison methods, I know of two very anti-herbicide people who were each faced with such massive poison ivy problems that they both resorted to herbicide. I like to recommend finding someone with goats who can bring the goats to eat it, but I have heard of situations where the goats ate not just the poison ivy, but everything in sight, so they gave up on the goats. So here we give you the two general approaches: pulling it out or poisoning it. For do-it-yourselfers, those are the only options. Unless you count goats as a realistic option. So the other real option is to find a professional, which is why we created our list of control services. 1. Pulling it out by the roots or cutting it down. Small ground vines have surface roots that run just under the leaf litter, so you can pull them right out, as you can see here. It gets tricky when the vines are wrapped around wire fences and stone walls. Big older vine roots can go down a foot or more, and you will need to dig with a shovel. However, cutting the vine off at the surface might kill it, so you can start by cutting it off, then deal with it later if it does grow back. Unless you plan to garden where the roots are, in which case, they have to go, so shoveling might be needed. Some people soak the ground to make it easier to yank out or dig out the roots. Tearing down the climbing vines is easy when they are thin, but they can get up to a few inches thick, in which case you will need a saw, and possibly a winch or vehicle and a chain to tear them from the tree or wall. Needless to say, this can get dangerous even aside from the rash you might get from the sap. Beware of the plant sap you will unleash! 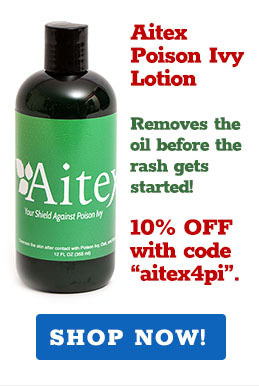 Whenever you tear the leaves, vines, and roots, you unleash plant oil with the urushiol that causes the rash. 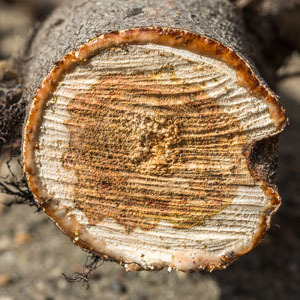 Cutting the vines and roots can cause the plant to bleed large amounts of sap, and that can cause great misery. Don't use a weed-wacker device, which will pulverize the plant and spray the sap all around. You would be wise to wear safety glasses. Getting a tiny fleck of plant sap in your eyes would be the start of a bad summer. Wear thick rubberized gloves, not latex. The word is that the plant oil can soak through latex just the way it soaks through your skin. So you might want to wear rubber gloves with work gloves over them to protect them from tearing. There is also no easy way to dispose of the plant. You must NOT burn it, as that releases dangerous amounts of the oil in the smoke. You should not just put it out in yard waste or trash bags without checking with your town about their policies. 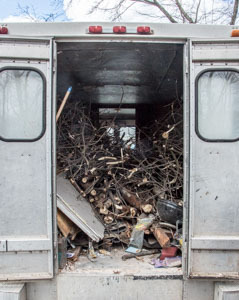 You can bury the dead vines or toss them into an unused area on your property, if there is one. When you are done you should rinse yourself and your tools off thoroughly with a hard, cold spray from a garden hose. If you have a swimming pool handy, jump in. The chlorine should help to neutralize the oil. After all of that you can wash normally. Remember that hot water and soap tend to open the pores and let the oil right in, so don't wash with soap and water until you have rinsed off with lots of cold water spray. The clothes and shoes that you wore will be covered with the plant oil. If you can afford to, you might want to throw them away with the dead poison ivy vines. Otherwise, I would suggest washing, maybe twice, with some bleach. Consider using Tecnu to wash off your hands, arms, and other areas after you are done, but soon, because the oil can penetrate your skin in a half hour. Wash off your tools with a hard spray from a garden hose, or wipe down with alcohol. Assume your boots are covered with sap, and wash them down with the same hard spray, and alcohol. Herbicides will kill lots of plants, not just poison ivy and oak. 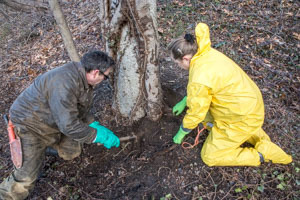 There is a variety of chemicals that are sold to kill poison ivy and oak, but all of them will also kill any broadleaf plants, including trees, garden flowers, and vegetables. And the health effects of these products on people and pets is questionable, so I personally see them as a last resort. Some people find you need multiple applications to kill the plant, while others find just one works. Probably depends on the hardiness of the plant and your choice of poison. Read the directions! So if you use a weed killer chemical read the directions carefully, and use as little as you can. 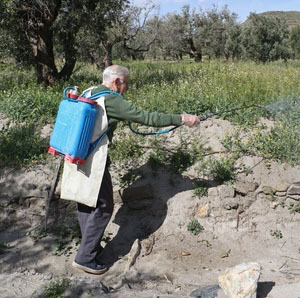 Overuse of broadleaf killer can kill off your cherished plants and even trees. Safer herbicides? I have been told that a vinegar and salt solution with some soap will kill poison ivy, but have not tested that out. I will test that this summer (2017) and post my results here and in a blog post. If you know for sure of safer ways to kill the vine, let us know.